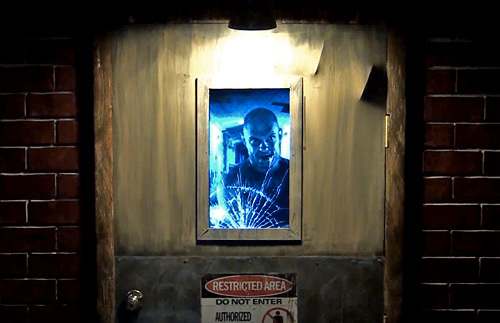 Animatronic Asylum Door Prop – Your Hallowe'en Planning Is Officially Over | OhGizmo! Yeah, I know, it’s not even October yet and I’m already posting Hallowe’en related gadgets. But if you want your house to be truly memorable to local trick-or-treaters, you gotta start sooner rather than later. Particularly if you’re looking to integrate something like this into your haunted decor. The Asylum Door prop looks exactly like it sounds. A grimy, weathered door at an insane asylum. Except that instead of a reinforced glass window, there’s a 22-inch LCD display showing footage of an inmate trying to escape. The cracking glass effect when he hits the window with an ax is cute, but it’s when he starts swinging at the door that the real tomfoolery begins. As you can see in that video, thanks to some cleverly hidden pneumatic mechanisms, it appears as if the blows from his ax are actually having an effect on the metal door. Bulging it out on the viewer’s side. After a really lame effort the inmate gives up — probably to go watch Wapner — and the door subtlely returns to normal. A company called Pale Night Productions claims to have first created the effect, and sells a slightly different version on their site for $3,750. While the one appearing in the video is available on Etsy for $3,500. I know Kip from Pale Night Productions personally. And I also saw the original door he came up with now years ago. Awesome guy, shame there are the copycats. Of course the stuff he is making now blows that out of the water.